It is recommended you take a trip to Karamja to grab the Rogues purse and Snake weed first. The Rogue's purse is obtained from the same wall in the cave north of Tai Bwo Wannai as in Jungle Potion. The Snake weed can be found on the ground southwest of Tai Bwo Wannai. Talk to Shrek in his swamp Grish in Jiggig, south of Castle Wars. The basic translation of what Grish is saying, is that it is all ogre because ogres are getting sick for some reason, and he needs help getting to the bottom of it. Grish will give you a few cooked chompies and two super restores. Talk to the ogre guard and mention Grish gave you permission to pass. In typical ogre fashion, the guard opens it by smashing the barricades. Run east past the Zogres. If you get attacked and diseased don't panic-just wait to use those super restores when you need them. Go down the stairs and then proceed northwest once inside the caves to the darkened area of the minimap. This will trigger a cutscene that pans over a area. Walk over to the skeleton spoop and search him. He will come alive as a Zombie(level 39) and will attack you! Defeat this master of spoop and loot his corpse. Open the backpack and you will receive a knife among other items. Search the lectern behind where the spoop resided. Use that knife on the coffin to open it up(Ogres are pretty bad at locking things). Once its open search it and get a black prism. Backtrack through the cave and return to Grish. Go to the bar in Yanille and use the Tankard you obtained from the spoop on the barkeep. He will remark that it looks familiar and point you to go to the Magic guild to speak with Zavistic Rarve. If you do not have the required magic level, you can simply ring the bell outside the tower. Zavistic will point you in the direction of Sithik. Sithik is acting sick in his bed upstairs in the guest house north of the tower. Talk to him and tell him your searching his room. After searching the dresser, cupboard, and wardrobe you should have a book of portraiture, a book of necromancy, a book of h.a.m., and papyrus and charcoal. Read the books and you will learn you can draw pictures of people. Draw a portrait of Sithik by using the papyrus on him. Return to the bartender and use the portrait on him. He will sign it confirming that he was there before. Return to Zavistic and talk to him. He will give you a strange potion which you must put in the tea at Sithik's bedside. Go downstairs and upstairs again. Sithik will have become SHREK! Talk to him and explain he can only go back to his swamp once he tells the truth. He will confess and you will exhaust all the dialog options. You need to make Brutal arrows and Relicym's balm. Use the resulting potion on Uglug Nar by Grish, he will give you some cash and grant access to his store. Note: Higher levels will likely be able to tank Slash Bash, casting crumble undead is another option for those of the magic persuasion. Talk to Grish and inform him of all the happenings. Grish will give you a key. 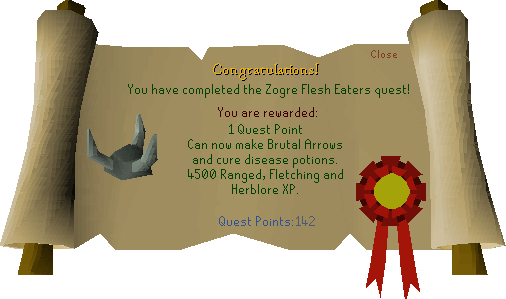 Talk to Grish again and say "There must be an easier way to kill these zogres". He will teach you the ways of the Shrek and how to make a composite ogre bow. To fletch one, you need achey logs, wolf bones, and obviously a bowstring(which can be bought from Uglug). Now that you are geared up head back past the barricade and into the cave. head west until you see a door on your minimap and open it up. Don't chug your potions just yet! Enter the next room and run past the enemies to the end of it. Search the stand that is there and a wild Slash Bash has appeared! Flip on protect from missiles a find a safe spot to range him or unleash a DDS spec on him. While ranging him watch your stats as they are going to be draining from the disease. Kill him and he will drop a load of dank bones. Keep these and take them with you the next time your around the ecto-they are worth a hefty amount of prayer experience. Return to Grish for your reward! Take that black prism to Yanni Salika in Shiloh Village for a cool 5k!